New schedule.....FCA meets EVERY Wednesday at the GREER CHRISTIAN LEARNING CENTER accross from the school at 7:40 A.M. The meeting will be out by 8:15. BREAKFAST WILL BE SERVED!! Get your church youth group involved, get your team involved, come with a friend, come by yourself....REMEMBER....it only takes ONE to be a leader....will you be the one?? Monthly meetings for the Greer High Chapter are held at the Greer Christian Learning Center across from the school. For more information, see Coach Jeff Neely or email him by clicking here. 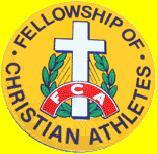 To visit the Home page of the Fellowship of Christain Atheletes, and read about news accross the nation with F.C.A. just click the FCA logo on the top left!! Crucifixion and Resurrection and His love for us, we could live in total victory! "Yet in all these things we are more than conquerors through Him who loved us"
ye shall have tribulation: but be of good cheer; I have overcome the world." Click the "Daily Bread" logo to read today's devotion!! Click the Sports Spectrum logo for great up to date news, scores, articles about your favorite pro & college stars, a sports based daily devotion, and much more from the world of sports from the Christian perspective. This is one great site! !